Teaching students practical academic skills and theoretical approaches early in their university education can build confidence, improve grades, and prepare them for life after Laurier. It’s the rationale behind Wilfrid Laurier University’s Foundations courses offered at the Brantford campus. And it’s one that proves to working, says Judy Eaton, associate professor and Foundations coordinator. “We want our students to hit the ground running when they start their degree. These courses give our students the basic foundations for succeeding in their courses, regardless of their previous education or current program,” says Eaton. Two Foundations courses are dedicated to the practice of critical thinking: BF190 and BF199. In these courses, students learn how to challenge assumptions, ask complicated questions, and to be open to new and innovative solutions. In the skills-based courses BF290 and BF299, students focus on developing academic literacy; writing effective essays, reviewing research findings, and active reading are some of the practical skills explored. Fourth-year criminology student Idris Omar says exploring the ideologies of influential philosophers in BF190 and BF199 encourages students to arrive at their own opinions about contemporary political and ethical issues. For mature student Maggie Lulkiewicz-Brooker, the skills she acquired through the Foundations courses have benefited her social work studies and her career. Report writing, a critical skill in the social sciences, is also part of Lulkiewicz-Brooker’s job as a youth mental health worker. Foundations faculty members assess the courses each year to ensure they are meeting their objectives. Eaton leads the assessment, surveying her campus colleagues about the quality of senior students’ work to determine if it has improved since the courses launched in 2015. The curriculum of the Foundations courses contributes to improved student skills but so does the learning environment, says Eaton. The interdisciplinary design of the Foundations courses encourages students to get to know their classmates from different degree programs. Establishing social connections and feelings of belonging can also contribute to overall student academic success, says Eaton. Students in the Foundations courses are also encouraged to apply in-class learning to experiences outside the classroom. Engaging in experiential learning opportunities can solidify new knowledge while developing career-ready skills. “We believe that a strong academic foundation doesn’t just come from the classroom. We want our students to be engaged in the broader community as well. By building experiential learning opportunities into the Foundations program, students learn early in their academic careers how to apply what they are learning to real-world situations,” says Eaton. 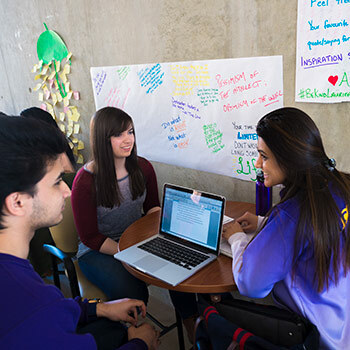 There are no shortage of experience-based learning opportunities at Laurier’s Brantford campus – ranging from student clubs to guest lectures or volunteering. Students are encouraged to reflect on their experiences in a written assignment for additional course credit. *Undergraduate students registered in the Bachelor of Business Technology Management and Bachelor of Social Work program are only required to take two Foundations courses.